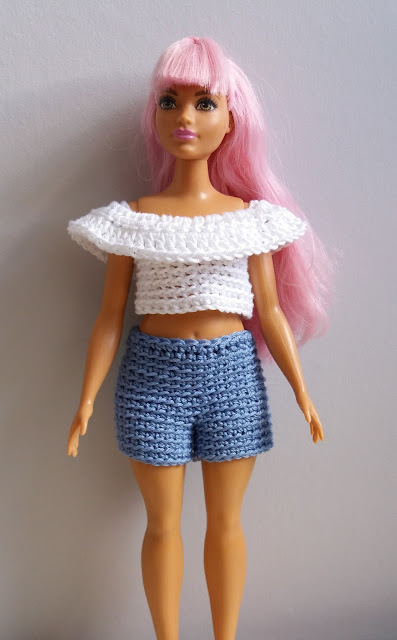 I've amended my barbie shorts pattern on this site to fit the lovely Curvy Barbie. Plus added a new top with a trendy frill across the shoulders. I used Patons Soft cotton 4ply from my stash but any 4ply would do. Both the shorts and top can easily be lengthened by adding a few more rows. If you have any problems with this pattern please leave a comment below or contact me. You will need approx; 10g 4ply yarn for shorts and 10g 4ply yarn for top. Work a round of 26dc in waist of shorts.